What a busy day this was! I was so preoccupied with the tasks I had to finish that I just couldn’t bring myself to come up with a mix and match outfit. So what’s a girl to do? Pick a nice printed maxi dress to make it seem like you actually made an effort. If you’re looking for something comfortable to wear but don’t want to look like plain old Jane in PJs, a printed maxi dress is your best bet. Maxi dresses are usually in billowy skirts so you’re free to move…like jagger. LOL! You know what I mean. They’re just so effortlessly chic. I think it’s because of the length. Anything long looks a little bit more dramatic. Make it printed and all the more! This particular maxi dress got quite a lot of nods. I can’t believe I was actually hesitant to wear it out at first. It’s cut a little low in front so I was worried my bra would show. Big whoop, right? Just go braless or wear stick-ons! But the thing about girls like me who aren’t gifted in that area is that, as much as possible, we like wearing our bras. Bras give our babies that much needed lift and support. We need all the help we can get, people! So imagine my happiness when I found this low cut bra from Wacoal. Problem, solved! There’s even a cute little diamond square in the middle. How girly! Hi! I really like your style. U are so pretty! Just want to ask you about the animal prints, is it still in this year? no wonder you’re part of the _______ whoopsie! that’s a surprise heehee. you totally deserve it! hope to catch up (close!? ambisyosa lang haha) with u on Friday (u know what I’m talking about, ryt?:p) ! Hanggang tingin na lamang ba ang mga katulad kong pang-supermodel ang tanggad? 5’1?!!! Kapag nagsuot ako ng mga ganyan, hihilahin ko pa ang laylayan…*Sigh* Lyf! Ayun, ang nangyayari, hindi ko gusto ang pagkaka-gawa. Nahahalatang in-alter. Kainis! Hindi kasi umubra yung talon-talon pag new year, eh, ang laki tuloy ng problema ko. Siguro rin dahil so-so lang ‘yung pinapag-alteran ko? AH! Ewan! Ang alam ko lang, ang TANGKAD ko, grabeh! um hi camille, mag tatanong lang ako kc may classmate aq sabi niya you know her , name niya is Wyel Bartolome medyo chubby na may bangs you know her? very elegant, i love the dress. I actually was looking for a maxi dress, but can’t find one.You are very pretty. Camille, you look absolutely beautiful! Great bag! Can you please give tips on how to style a maxi dress for office? I’d like to wear one to work but I dont know how. And do you think its okay to wear a maxi dress with ballet flats? Thank you! The pattern on the dress still seems feminine even if the colors are monochromatic. I really love the way you pose here. It brings beautiful shapes to the dress! My favorite part is your choice of sandals. You’re rockin’ this pair of footwear! Amazing dress, you are beautifull. And I love your writing style as well – conversational and witty. And never boring. btw, what is your hair color ms. camille? I really love it… You are the best Camille.. : ) Your blog posts makes me comment despite my busy life in the office :) hehe! Haha! How random :) Umm I don’t know eh. If ever I do, not so much naman siguro or I just don’t notice haha! Love the printed maxi dress. You look gorgeous in this dress. “Bras give our babies that much needed lift and support”. Love the way you called them babies. I totally understand what you mean. Thanks Naaj! :) Haha! Babies! Yey, a first comment on your blog. :) I know it always makes you smile whenever you receive compliments and comments from fans. And that just makes us love you more. Yes, I agree, maxi dresses are definitely must-haves. I actually just developed a love for them over the summer. By the way, I lost track of how to check out Coexist coz Multiply’s gone. Hi Camille! I’m your newest, biggest fan! I’ve always loved fashion ever since I was a kid just like you. Your blogs make my day. I’m a very busy (working) mom that I would sometimes neglect how I look when I go out (office, supermarket, mall) . Thanks for inspiring me to dress up, to look good and feel good (again)! PS. I read that you also love Pong Niu! She did my make up at my sister in law’s wedding! She was the best! wow, this dress looks cool, and it’s always helpful when you give us the tip about undergarment! Love you! Love the print on this maxi…you look great! Yes it can actually! :) Thanks Dhes! LOVE LOVE THIS. 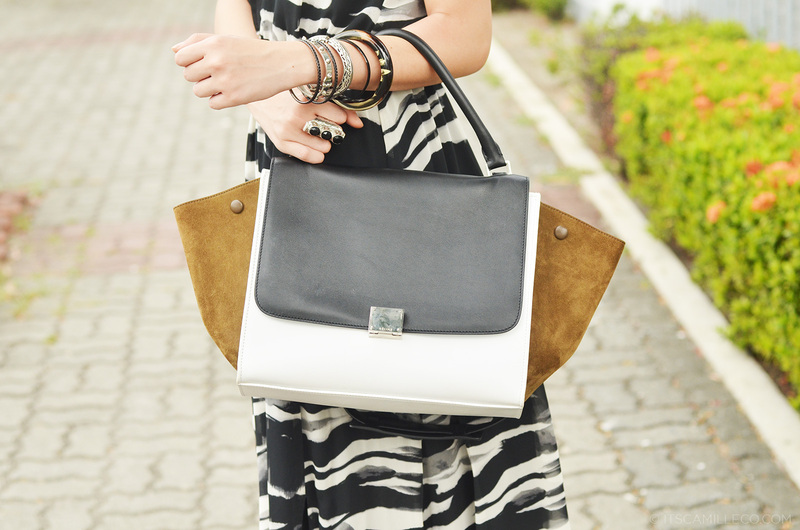 Simple yet still elegant and stylish, love your new bag!!!. could you do a post on “Links I love”.?? read this on the cupcakes and cashmere’s blog. Thanks..
What kind of post is that? Sounds interesting! Loving this easy breezy look even though rainy days are starting! Its you already! Ikaw na!!!!!!Haha! So beautiful! Love the dress, looks really good on you, I was wondering how tall are you? I wish I was gifted with some height so I could wear something like that. Love those campaigns! :) I wish too! great pictures and an amazing outfit. Thanks Yanshi! :) I agree! i hope mag ka h&m na dito sa phil !! i love all your clothes from h&m!